How does one’s summer end? Is it the first hint of rain or the sign of morning sun that can wake one’s good sleep? 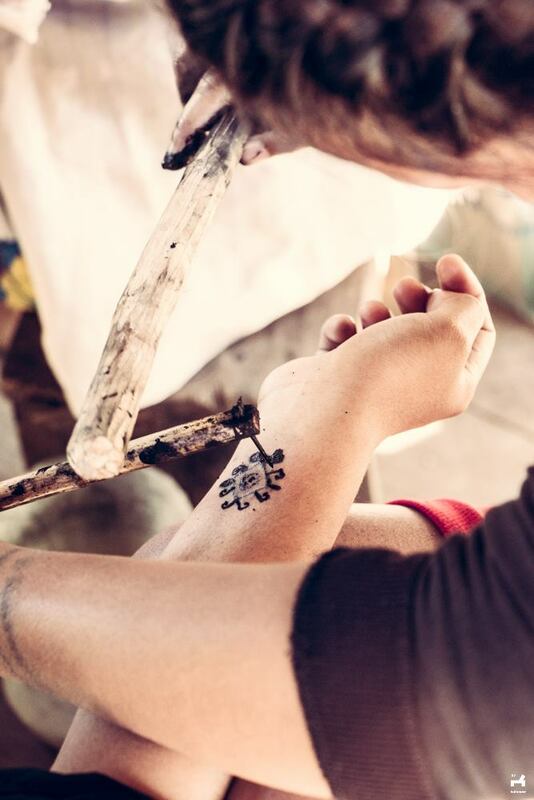 Months ago, a friend planned a trip to Sagada in the Mountain Province, with a short detour to see the oldest traditional tattoo artist in Kalinga, Apo Whang-Od. This was something I’ve been looking forward to for so long. There’s something profound in experiencing an aspect of our culture that may be lost in time. This country has so much history that’s slowly fading. Now, we focus on the current trends, losing sight on what we’ve been or what we have. 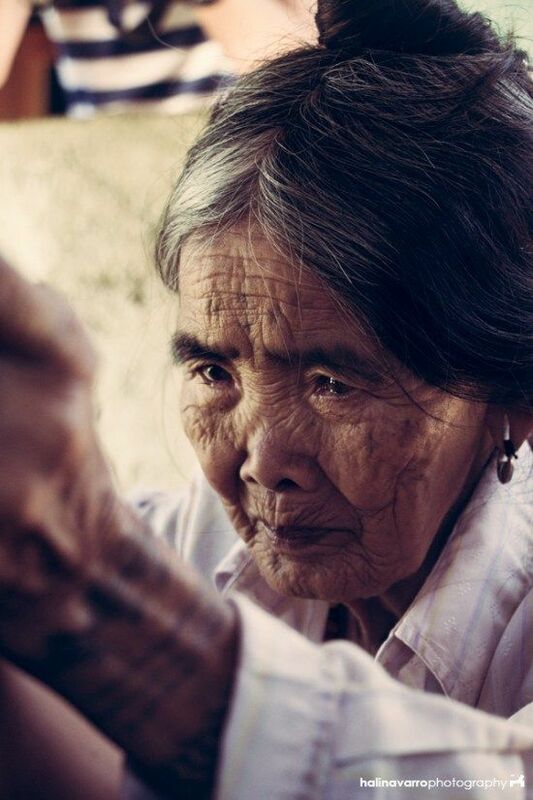 To be inked by the oldest mambabatok in Bontoc is a way to be reminded of an old culture, a mark of what used to be. The first planned trip was cancelled because the organizer had prior work commitments. I ended up having to find a new way for this to happen. Luckily, after a few months, a friend informed me that they would be having an outreach for the kids in Buscalan Village on the last weekend of May. I invited some friends and coworkers to tag along. Fourteen or some more hours later, we arrived in Tinglayan, the fourth class municipality in the province of Kalinga, located north of the Philippines. 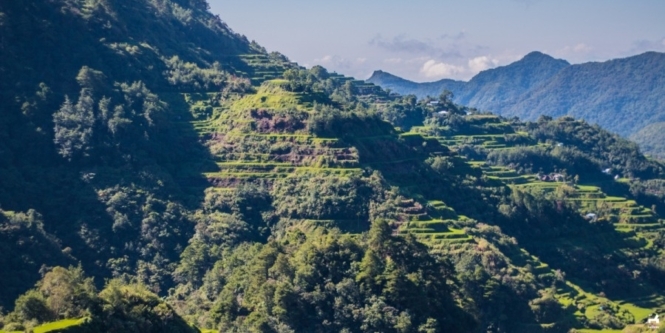 Split into four groups and four vans, we had stopovers to see rice terraces that were once only seen in the pages of history books. This greeted us when we arrived at the jump off point. 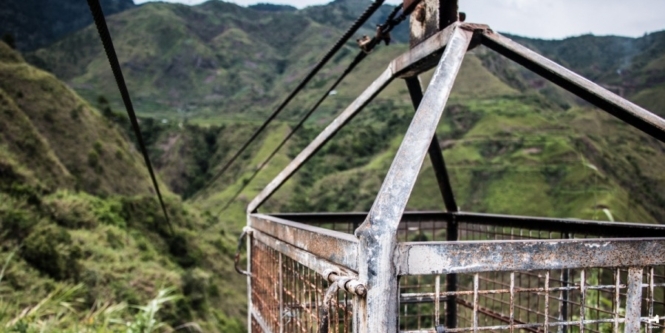 A pulley that can carry heavy packages to the village. The view from this steep cemented walkway brought ease; a calming breeze followed. At the tiniest gap between the road is a clear waterway that I think may be a water system for the rice terraces in the distance. 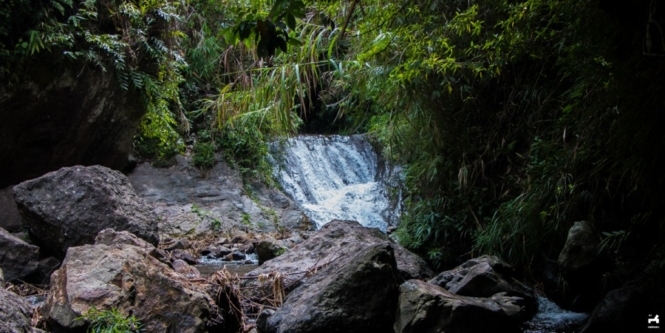 A few more walks, after half an hour or so, there was the sound of water rushing, echoing a sense of comfort of seeing a waterfall that one can bathe or drink in. It did not disappoint. We arrived at the village. 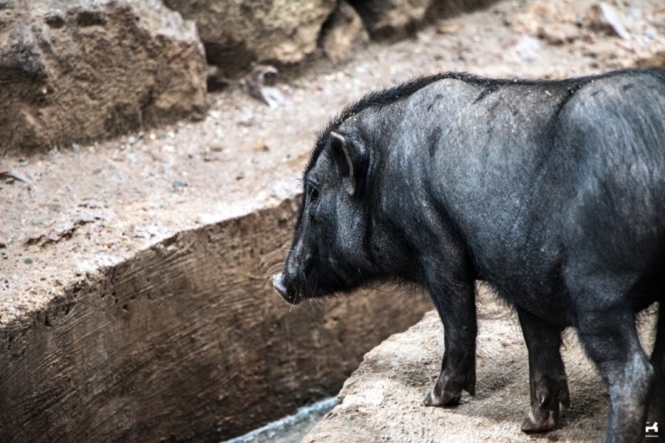 Black pigs could be seen roaming around. For someone like me who grew up in a city, this was a rare sight to experience. The pigs acted like household cats, minding their own business and strolling around. It started to rain. We were greeted by the villagers with smiles and coffee, which tasted a bit like coffee in Batangas. The trek was paid off. We put our bags and stuff on a house the villagers prepared for visitors. We gathered at the site where Apo Whang-Od conducts the tattoo session. Once she arrived, everyone was in awe and just wanted to capture a smile or laugh this old lady greeted us with. A birthday celebrant in our group got a centipede tattoo on his back. He drank some gin before being tattooed. The centipede tattoo means protection and represents a spiritual guide, fitting for someone celebrating a birthday. Rain started pouring, and on that day ,only one person was tattooed by Apo Whang-Od. 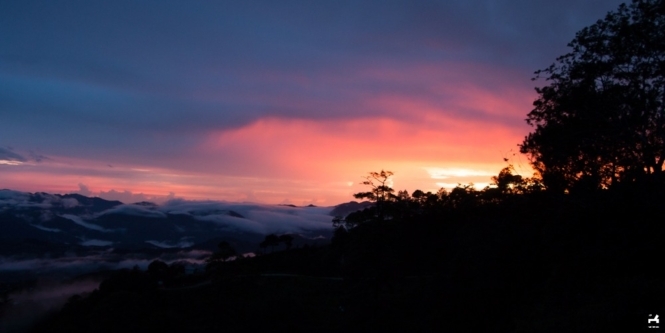 Back in our room, there were electricity to charge phones and comfort rooms with continuous water from the mountains. The night was spent playing cards and teasing each other. Some cooked sinigang for dinner. The rain continued ’til past midnight. My morning was greeted with my sandals missing, which my friend borrowed to stroll around and see the morning sun. We had some chat with the locals that offered us coffee. Some prepared for the outreach, while I went to see Apo Whang-Od that morning. There was a lot of people in line to be tattooed. Some of them were from Cebu, and they stayed a day ahead of us. The line was long because there were lots of groups that wanted to get marked. 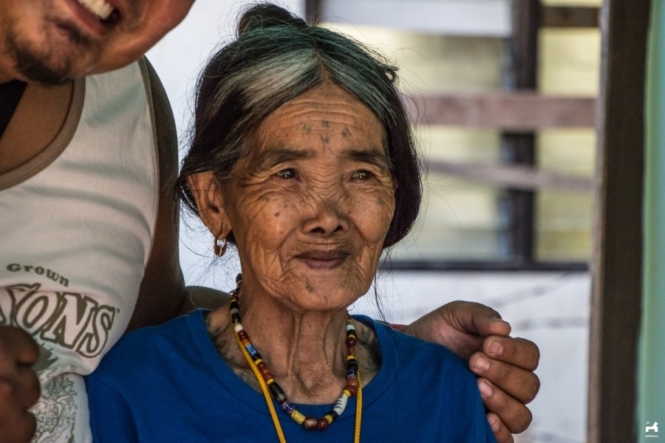 Grace, Whang-Od’s granddaughter, was the first to start tattooing the visitors. After a while, Eliang, Apo Whang-Od’s younger niece, joined in to tattoo the others. I asked who was next in line, as the organizer for the session formed a loop that included one from each group so that everyone would have the chance to be tattooed, starting from a small tattoo to large ones. I was third in line to be tattooed by the legendary Apo Whang-Od. While waiting, I browsed through the book about Kalinga tattoos. Before, I wanted my tattoo to be “kidlat” (thunder). I learned that this was derived from the “karayan” (river) tattoo, which means influence or to influence. The latter is what I decided to be marked on my left arm. I waited and thought that there would be enough time to catch up with the on-going outreach, a walking distance from where the tattoo session was taking place. The friends I invited were in the outreach, participating. Before my turn, Apo Whang-Od had some lunch. It was almost half a day of waiting. I didn’t mind, and when she was back, the session started. The tattooing process was painful. 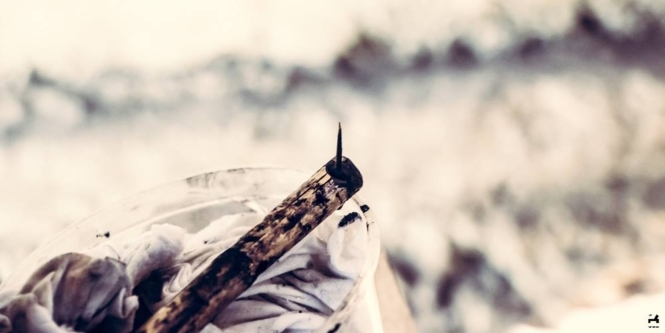 After a while, the skin began to numb and the pain lessened, but whenever the needle hit the bone, especially the nerve, I cringed. I took pictures while being tattooed, and Apo did not mind. 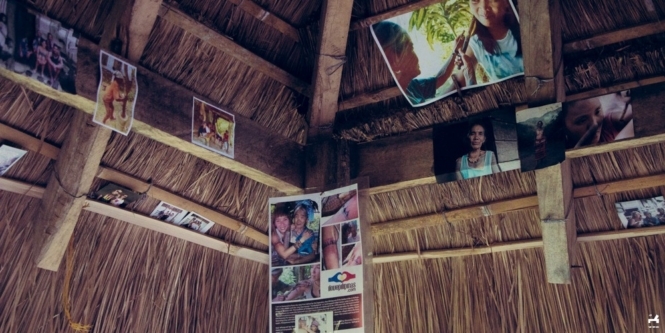 We were tattooed in a hut with pictures of a lot of visitors glued or taped on the wood just below the roof. The view was a bliss. There was greenery, the only noise is the giggles and laughter of the other visitors. It was quite an experience. After it was done, Apo Whang-Od spread coconut oil on the fresh wound. The other guide calls it “sperm.” Coconut oil changes when it stays longer in the cold. Just then, my friends came. I missed the outreach. I hugged Apo Whang-Od after the session and took a picture. We packed our things and were thankful for the safe and wonderful experience. It was sunny and another long walk back to our vans. Some of our group went for a swim to a nearby falls. I’ve learned only a little about the marks and nothing much about the history enveloping of what I think was once a rich culture. There’s a large number of people who visit and look for cultural souvenirs such as tattoos, but most don’t ask what these are for. 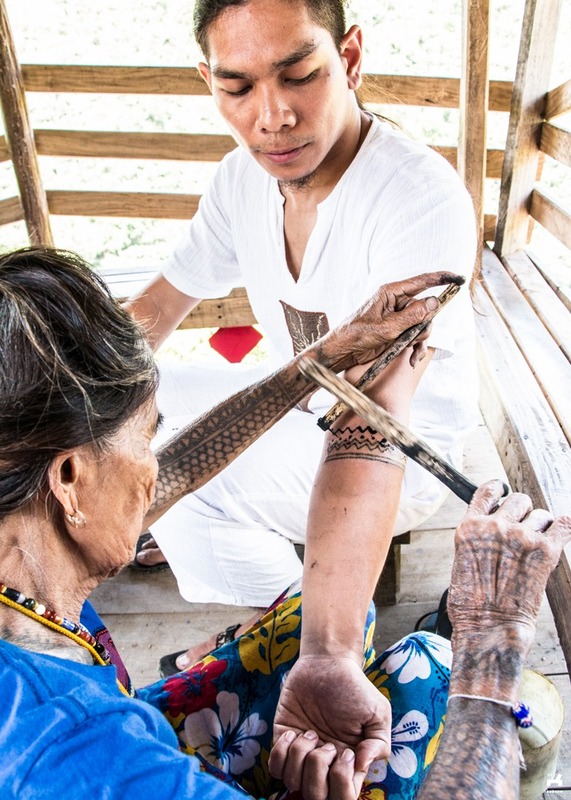 I haven’t had the chance to talk to Apo Whang-Od to ask about the history of the traditional tattooing in their tribe and other stories due to language barrier. What I found out about my tattoo is it’s from the Ilokano term for river, “karayan,” and this information was from a book. Though I’m marked, it’s uncertain if this alone can preserve a culture. As we travel back, we witnessed a great sunset and I took a picture of a sighting of some sea of clouds and great sky hues pointing towards the sun. This was the last day of May. Kat and I celebrated in different places. A month ago, I got my first tattoo and my pasalubong to Kat was this story. The end of summer. P.S. 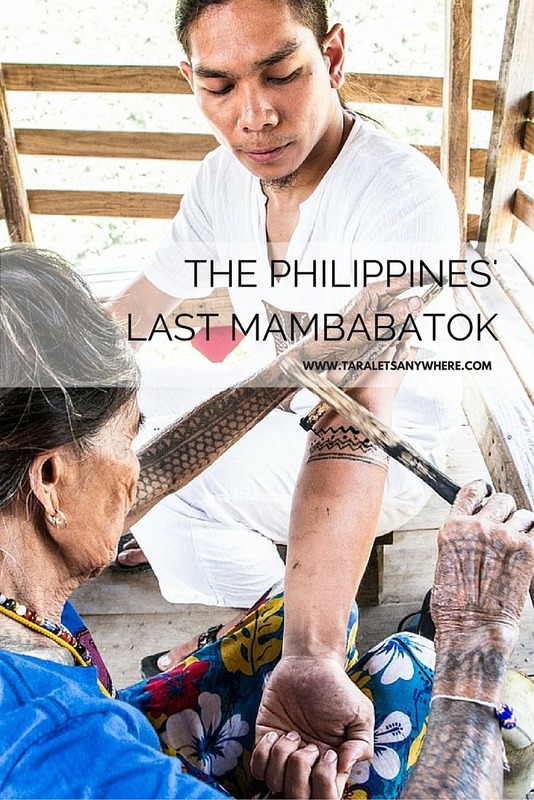 If you’re looking for a travel guide to getting a tribal tattoo from Apo Whang-od in Kalinga, check out this guide from The Broke Backpacker, updated as of July 2016. I wanted to go with Hali when he said he’d visit Apo Whang-Od, but the tattoo designs are limited and I wanted a different one. Still, from his stories and the photos it seems like an amazing experience indeed. 🙂 He says it’s a privilege to be part of an ancient culture. This is so interesting. I have read about others going to have Apo Whang give tattoos and I am in awe. This was the first time I saw the instruments that they used for the tattoo. I am not sure if I would be brave enough but since it seems like a great honor you would really want to have it done. What a beautiful trip you had! He drank alcohol before the tattoo? That’s actually discouraged before the proceed because it tends to make the blood thin, therefore, it would be more bloody? So was his tattoo session bloody? I got my Apo Whang-Od mark in 2014 and I remember feeling starstruck the first time I laid eyes on her. The batok was really painful but I endured it because I wanted Apo to do it even when they said Grace does it gently. Ang galing ng experience ninyo. 🙂 You saw some really scenic views and to ba tattooed the traditional way… gosh, looking at the photos already is enough for me to feel the pain, and yes, I also have a tattoo I got way back when I lived in Boracay. The pain… and yes, gin is recommended. oh gosh.. it does really look painful. But seeing that kind of art is just so amazing. 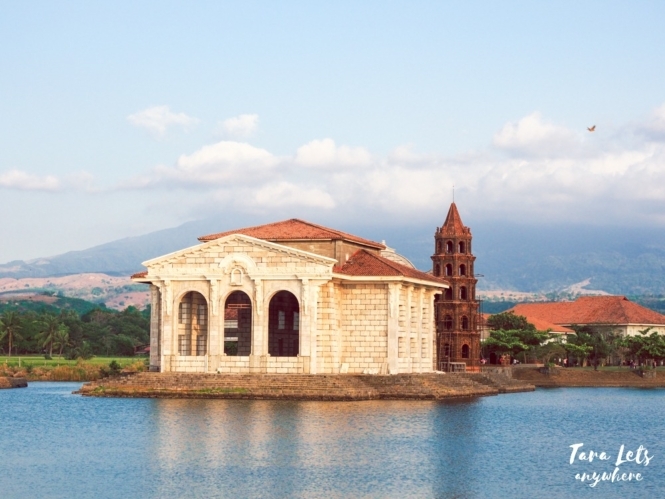 There are a lot of fascinating places and culture in our country that needs to be discovered. You’re so lucky enough to witness such beauty and talent of Apo Whang.